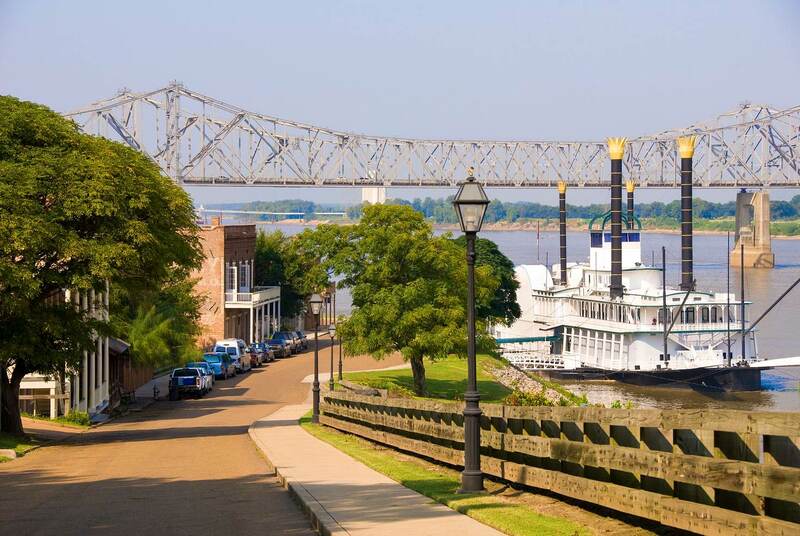 Natchez is a city that has weathered three centuries of tumult and transformation. It is one of the oldest continuous settlements on the Mississippi River, besting New Orleans. It was spared much of the physical destruction that other cities saw during the Civil War, and its unrivaled array of antebellum architecture offers a singular experience of a transformative era of American history. Natchez was born 300 years ago on the banks of the Mississippi River. The establishment of Fort Rosalie by the French in 1716 forever changed the area from one of sacred ground for Native Americans to a hub of commerce for European settlers: Natchez and the nearby settlement at Emerald Mound had been an important ceremonial site used by indigenous people for a thousand years. For 2016, the city of Natchez has devoted an entire year to celebrating the diverse cultures and traditions that have shaped this place over the last three centuries – from a month-long music festival to weekly legends-and-lore lectures and walking tours to a grand, old-fashioned birthday party in August. Recent civic improvements, including new additions to the Natchez Trails project of walking and cycling paths, prove that this jewel of the Mississippi has never shone brighter. Natchez is a place inextricably linked to the past – long before European settlers arrived, there were indigenous people here as far back as the 8th century BC when the area was used as a ceremonial site and burial ground, built to pay homage to the people of the Mississippian culture. The 18th and 19th century saw Natchez rise in importance as a port city, as trade moved the cash crops of cotton and sugar cane up and down the Mississippi, from New Orleans to the northern cities. The 20th century ushered in another period of change for the city, as the importance of river commerce declined and the city reinvented itself once again as a cultural destination, offering a glimpse of life in pre-Civil War America that can’t be found anywhere else. The complex of man-made structures at Emerald Mound comprises the second largest Pre-Columbian earthwork in the USA. There is a trail that takes visitors around the site, and you can climb to the top of Emerald, the highest mound. It is about two times as long and three times as wide as a football field, and reaches 35ft high – from the summit you can look across the same thick swath of forest that stood here 300 years ago. The Grand Village of Natchez Indiansfeatures three earthwork mounds, a reconstructed Natchez house, and a small but informative museum featuring Native American crafts and artifacts. The grounds provide a peaceful backdrop to reflect on the hundreds of years of human habitation this land has seen, and is a good choice for a picnic. The Grand Village is also the site of the annual Natchez PowWow, a two-day celebration of the Natchez culture including dancing, singing, and traditional food and crafts for sale. The event includes Native American tribes from all over the South and the Midwest. Before the Civil War, more millionaires per capita lived in Natchez than anywhere else in the US, and the houses built here rivaled the most opulent and elegant mansions in the country. Today, Natchez boasts more antebellum mansions than anywhere else in the US. There are nearly 700 homes from the pre-Civil War era, many of which are open to the public to tour. These houses have been preserved with a meticulous attention to detail, down to the original place settings in the dining rooms, lace and other textiles in the bedrooms, and even the original wallpaper remains in some residences. It is astounding that these items, including delicate porcelain dishes and Waterford crystal gasoliers, were able to be preserved through the Civil War until the present day. For almost a century, Natchez has hosted spring and fall ‘pilgrimages’. The Pilgrimage is a period when many of the historic homes are open to the public and docents in period costumes provide tours, complete with enormous hoopskirts. Tickets start at $15 for a single house tour, and packages for multi-house tours can be purchased as well. If you aren’t able to visit during one of the pilgrimages, there are mansions that offer tours year-round, including the impressive and architecturally-influential Auburn, built in 1812 and listed as a National Historic Landmark. Auburn was the first building in Natchez to be built according to an architectural plan, and it also features an usual ‘floating’ spiral staircase, which ascends to the second floor completely unsupported. The Mississippi River slips quietly past Natchez, the provider of livelihoods and leisure for the city’s inhabitants for three centuries. Historically, the river was the primary source of the commerce for the city, but today it offers a wealth of recreational pursuits. If you want to get up close and personal with the Big Muddy, consider renting a canoe and an experienced guide to explore the river the way people have traveled this water for thousands of years. Quapaw Canoe Company offers a variety of river tours in Natchez and the surrounding area. The annual Great Mississippi River Balloon Race takes place the third weekend of October, just when the heat of the summer begins to lose its oppressiveness. The event takes place over a weekend, with a balloon glow on Friday night, followed by a fireworks display over the river and live music, all of which take place in the historic Rosalie Bicentennial Gardens. Saturday and Sunday features competitive balloon races along the river. This year also features the inaugural Blufftoberfest Biergarten, a craft beer festival featuring local and regional breweries. Just outside of Natchez is St. Catherine Creek, a national wildlife refuge that offers hiking trails, wildlife watching, canoeing and kayaking, and is open year-round.